This post contains spoilers, sorry if you already read something you wish you hadn't. Vote for the 250 Greatest Sci-Fi and Fantasy Moments: This has been going around for a while now, and I already voted last week, but I decided to post about it on my blog, anyway. "SFX’s 250th edition is approaching rapidly. To celebrate, we’re compiling the definitive list of the 250 greatest moments in science fiction, fantasy and horror. You can vote in the poll, so it truly is a democratic list of the moments that have made our genre great. Anything is eligible, from comics, TV, film, books and games. Our experts have hand-picked 250 of our favourites for you to choose from, and here they are." You get to pick ten favourites and add one extra "other". You have until April 30 to vote, and I'm sure, unlike me, many of you wouldn't really care about voting. But it's a fun list to go through and you'll probably, not unlike me, end up all nostalgic. Here are my top three most iconic, memorable moments, one from TV, one from a movie and one from a book. I'm not big on sci-fi but even I had a hard time choosing three out of 250 - there were at least twenty other moments I loved, along with the rest I voted for in my top ten. The Doctor's and Rose's final goodbye, the Firefly scene (I don't remember which, but come on,) the 1984 Room 101 rat-torture, the Fahrenheit 451 snow scene, Angel, Fringe, the Hitchhiker's Guide "answer" moment, the... you know what, there are just too many. You might find my blog getting kind of repetitive with Discworld, Stephen King and Whedon references, but I'll never tire of them - they're not my favourites for no reason, and: I still do hold that they're all pretty undervalued. Buffy: Everybody wants to help. I don't even know if I'm ... here. I don't know what's going on. Never done this... That's just an amazingly dumb thing to say. Obviously ... I've never done this before. Tara: (softly) I have... My mother died when I was seventeen. Buffy: I didn't know. I'm sorry. Tara: No... Yes. It's always sudden. "It's always sudden." and "It's always different." - That made at once teary and empowered. I doubt there is anything quite as terrifying in the WORLD as Sissy Spacek wide-eyed, screaming and covered in blood. No description from the book could have prepared me for that iconic scene. Of course, the book isn't written linearly. You know what Carrie did (well, kind of) far before she was actually driven to it and you know explicitly the prank they have planned on her, so even amidst all the gore, you know she's angry and violated and you even feel an inkling pity, and a little of her vengeance makes sense - but in the movie, it's all so fast and so unexpected. 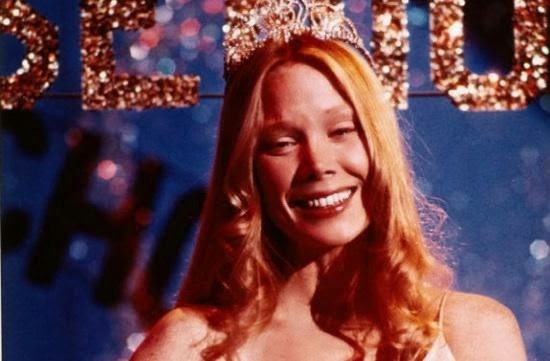 She's been practising her telekinetic powers, sure, but that scene from that (pictured) pretty and happy into a monster and God, Sissy Spacek is scary. It was effective and unforgettable, even though reading the book meant you knew it. 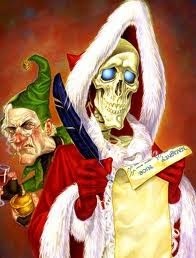 There is also a TV movie, Terry Pratchett's Hogfather, with Michelle Dockery as Susan Sto Helit's Death's granddaughter. Death speaks in unquoted caps, but he has no vocal cords, anyway, so you just hear the voice booming directly in your head. Creepy, right? But he's a good guy, just doing his job, and if that were not enough, he likes cats. All right," said Susan. "I'm not stupid. You're saying humans need... fantasies to make life bearable." Check out the list and let me know your favourites! 2001: "I'm sorry Dave, I'm afraid I can't do that"
DRACULA (1931) Bela Lugosi introduces himself with the words, "I am Dracula"
FLY, THE (1958) The spider-web finale - "Please help me!" FUTURAMA Fry's dog waits for him in "Jurassic Bark"
NINE BILLION NAMES OF GOD, THE "Overhead, without any fuss, the stars were going out"
TWILIGHT ZONE, THE Burgess Meredith's cracked glasses in "Time Enough At Last"
but how could i leave out ANGEL Illyria lets Wesley see Fred for the last time? Divers and Sundry - Yes, yes, yes and yes! Lol. And yes, that Angel scene is great - I wasn't particularly fond of what they turned Wesley into in Angel, but the tension between him and Illyria was sad and well done - when Fred's parents showed up and also in this finale! Wow, this is so great. I'm definitely going to vote for some of these moments, but there are so many good ones! honeyimreading - Glad you liked it. I know, how can we pick ten from 250, right?! Loved your choice. In my choice of genres, horror is a complete no-no. As far as Sci-fi and fantasy are concerned, a combination of a great story and a great author are very important for me to like them. Nimi Arora - Thanks, I'm glad you did. Carrie is horror, but the other aren't - so maybe you'll get around to watching & reading them. Thanks for stopping by!